PITTSBURGH — The suspect in the mass shooting at a Pittsburgh synagogue expressed hatred of Jews during the rampage and told officers afterward that Jews were committing genocide and he wanted them all to die, according to charging documents made public Sunday. Jews and our allies gathered tonight in New York’s Union Square to hold vigil for those killed in Pittsburgh today. As we mourned, members of the Muslim of the community guarded us. 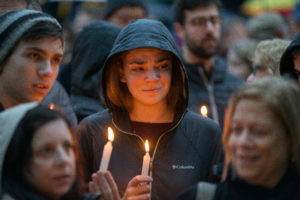 The gunman targeted a building that housed three separate congregations, all of which were conducting Sabbath services when the attack began just before 10 a.m. in the tree-lined residential neighborhood of Squirrel Hill, about 10 minutes from downtown Pittsburgh and the hub of Pittsburgh’s Jewish community.